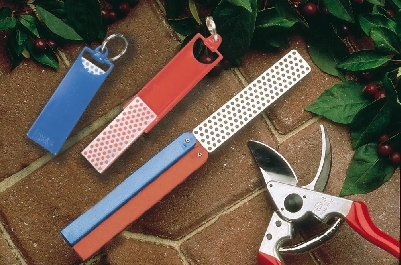 One of the DMT® Sharpeners below will mean that you can sharpen all your garden tools with ease. 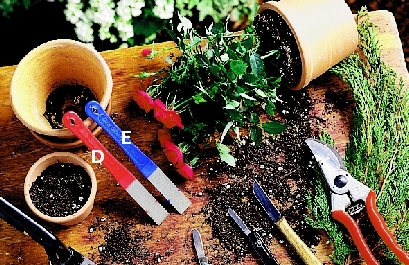 If you’re a keen gardener you should choose the Double Sided Diafold® (C) which has two grits Fine & Coarse. If it’s a Mini-Sharp you fancy then choose (B) which is the coarse grit. Similarly choose (E) if you want the smaller Mini-Hone® coarse grit or a Mini-Hone® Twin Pack with both Fine & Coarse grits. The Red (Fine) grit is most suitable for sharpening all your kitchen knives but Blue (Coarse) is better for garden tools. Mini-Sharp® with Key Ring (Red) Fine 600 Grit. kitchen knives such as “Global” Knives. For these use Red. Read more about this here. If you’re going to be sharpening a lot you’ll be better off with one of the four Whetstones below. Particularly the 4” Blue Coarse Diamond Whetstone™ Code: A4C which will last longer as you’ll use both ends by picking it up a different way each time!